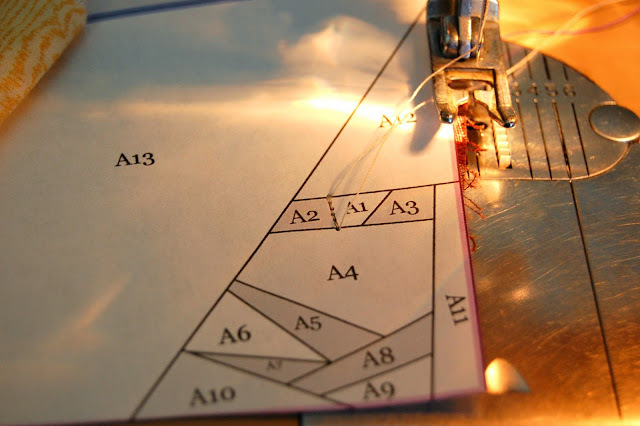 *Disclaimer* There are many great paper piecing tutorials and videos out there. Mine is just.... mine. Heck, I even make a mistake in this one, but we are imperfect humans. I am leaving it in there because it is real. 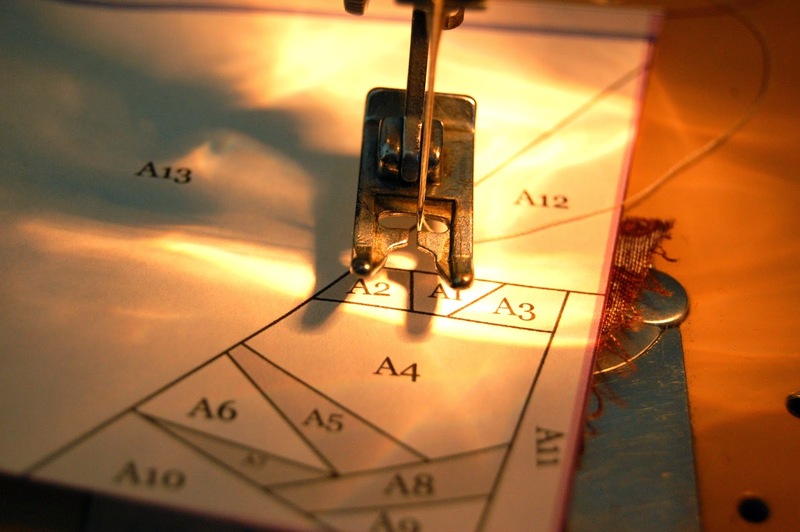 What I really want to showcase is the most amazing website in the world for a fandom loving quilt maker.... Fandom In Stitches This website is run by an amazing group of talented folks. They have worked hard and used their skills to create a database of free patterns to assemble the most fun quilts. The lone request is that the patterns only be used for personal quilting, not for retail or payment. Pretty generous. I am currently working on a Harry Potter quilt (oh.. about two years in the making!) but I have Lord of the Rings and Doctor Who on my agenda as well. If using this tutorial, please read through it first, like a recipe before attempting. Some steps may become more clear the further down you get. Paper piecing takes practice and getting used to. Think of it like a puzzle. Cheers! After you find a block you would like to create, print it! Make sure the scale is set correctly, and please click the blue link using the name of the block, not the photo. The left print out is too large, the right is.... well, right. If you are not sure, measure it with a ruler. This block is supposed to be 5 inches square. 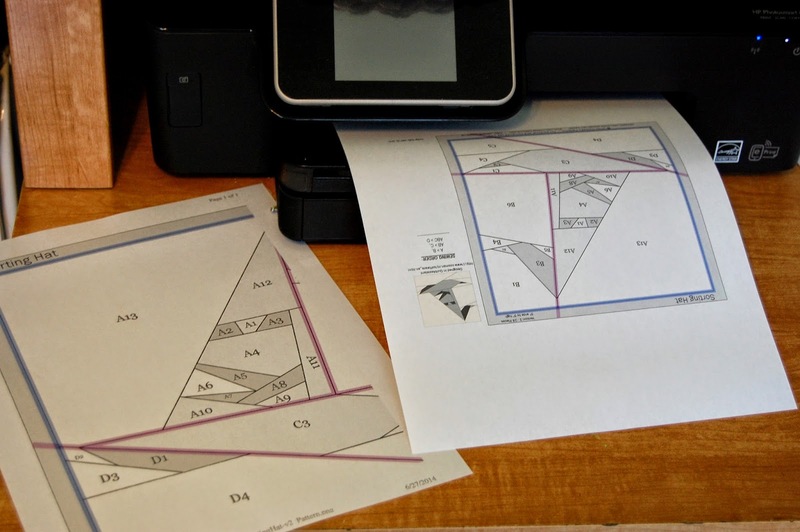 After printing, cut out the pattern along the designated lines. It should look like a puzzle. The grey outline is the seam allowance, this particular block does not include seam allowances inside the piece, only along the outer edges. 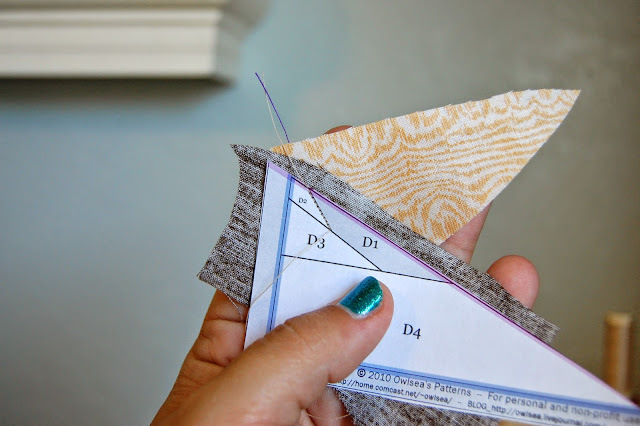 You will have to make doubly sure to use extra fabric on this one in order to create a seam allowance while piecing (meaning, use more fabric than you think you need). 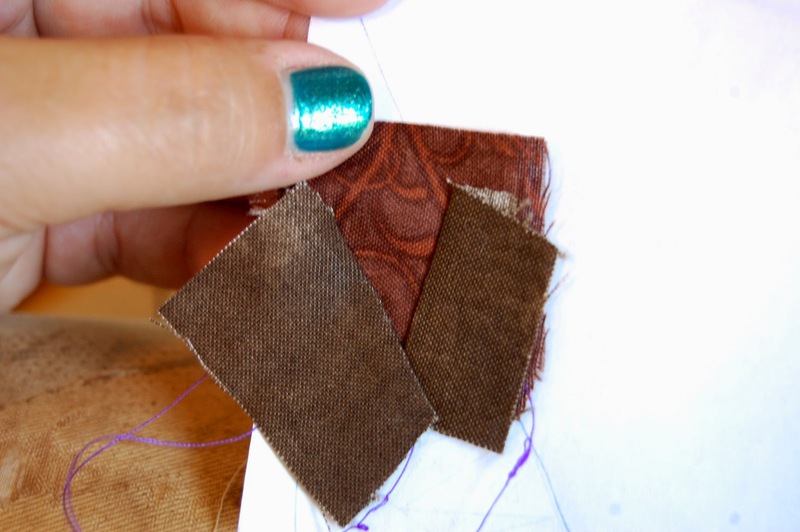 Also, keep the little key on hand so you know which order to sew the pieces together (upper right hand corner). The fun part! 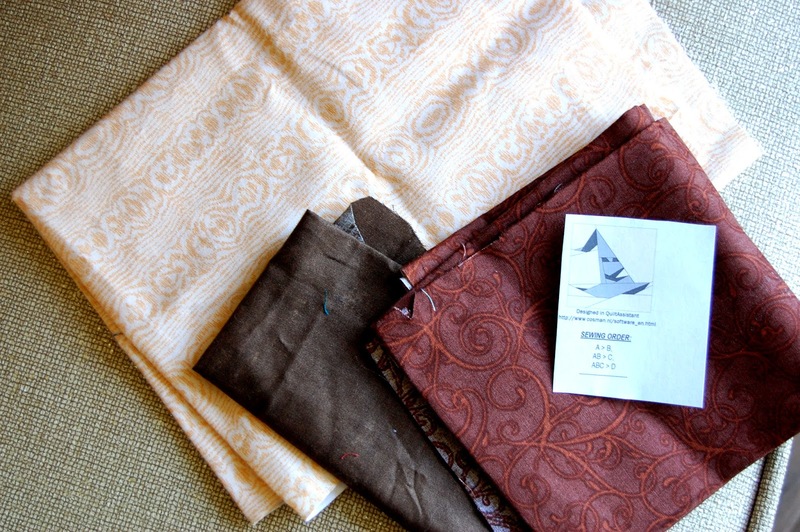 Pick out your fabric choices. I chose the red-brown swirl for the main hat, the dark brown for low lighting accents (eyes, mouth, shade) and the pale wood grain for the background. 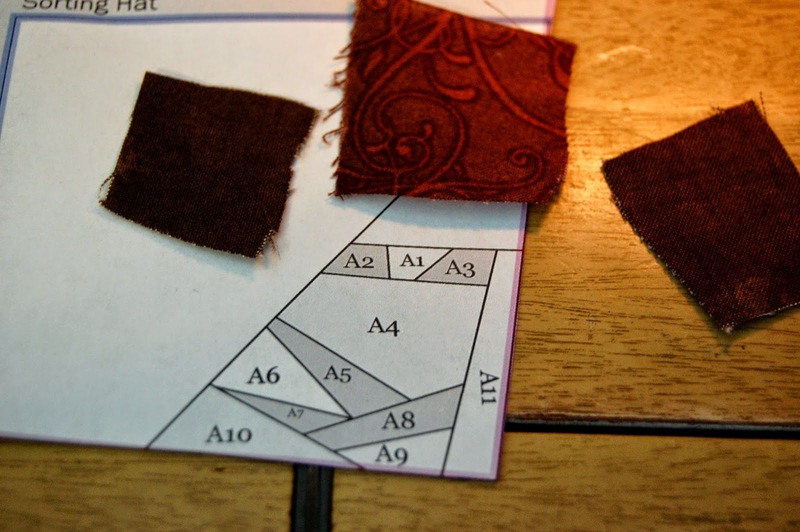 Always start with the number 1, which is the A1 piece (red-brown fabric will go there). Then the A2 (dark brown since it is the Sorting Hat's eye). 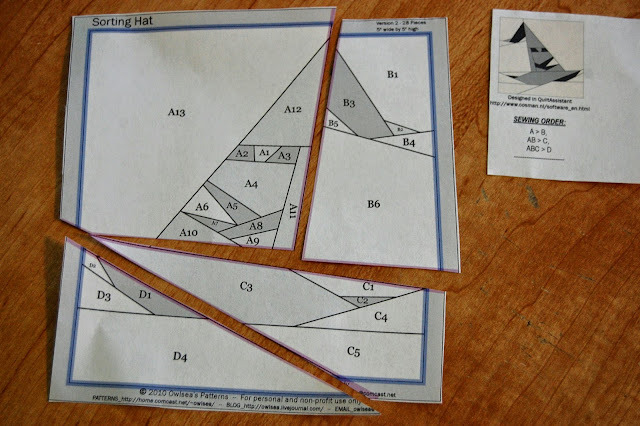 Paper piecing is a mirror image deal usually, you will notice that the hat is facing the opposite direction in the puzzle vs. the key. 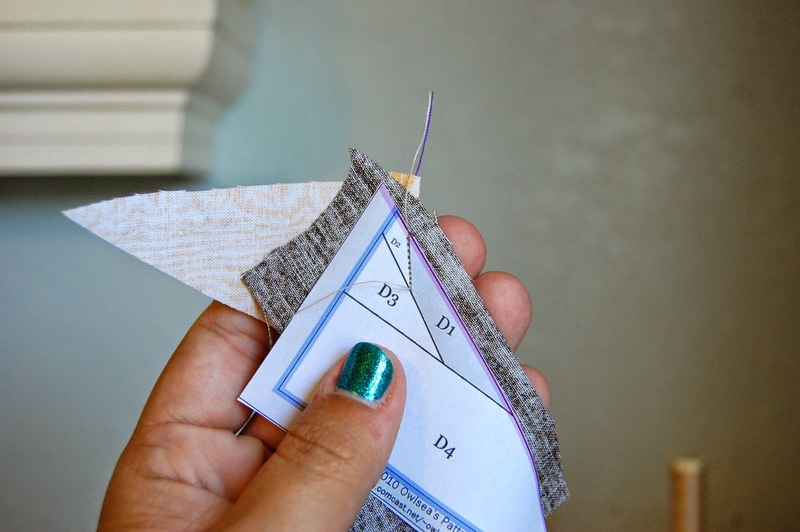 Sewing on the right side of the paper really matters if you are sewing letters (like the HP block up top) or numbers. 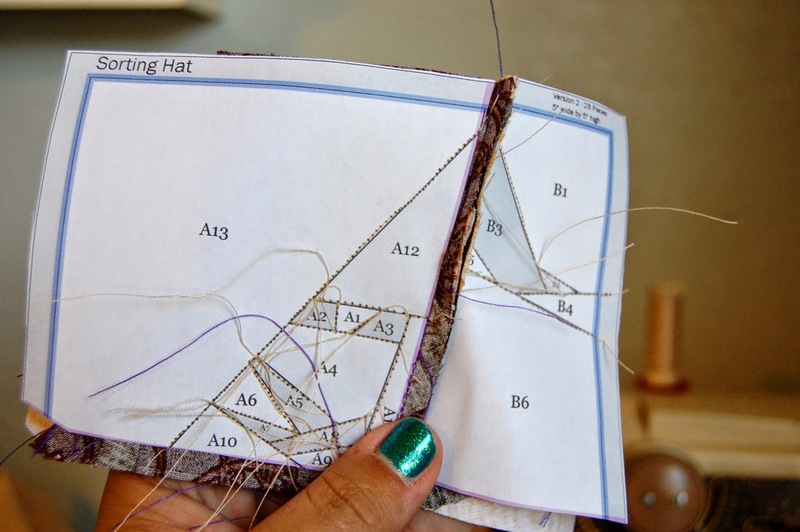 Otherwise, you can fiddle with the direction of the image (meaning you can sew on either side, the printed or the back). 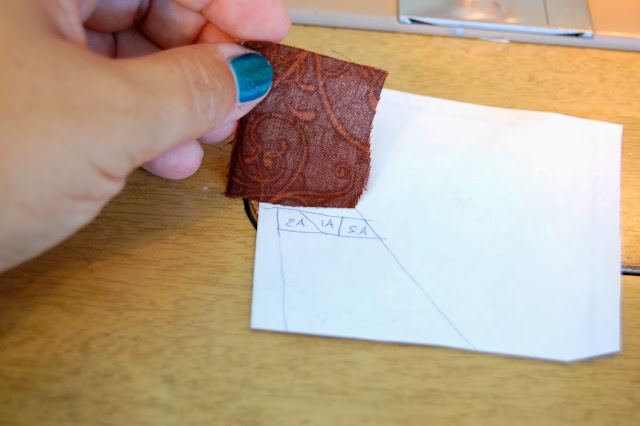 I want mine to look like the key so I FLIP the paper to the back (I sketched what the front had briefly to show where I am placing the fabric and make it easier to place the fabric where it needs to go). I put the fabric on top of the A1 spot, right side up (pretty side up). ***Cut your fabric pieces much larger than you think you need them*** There needs to be overhang for later. Next, locate the A2 piece on the paper. Place that fabric (dark brown for his eye), right side DOWN (non printed side up). 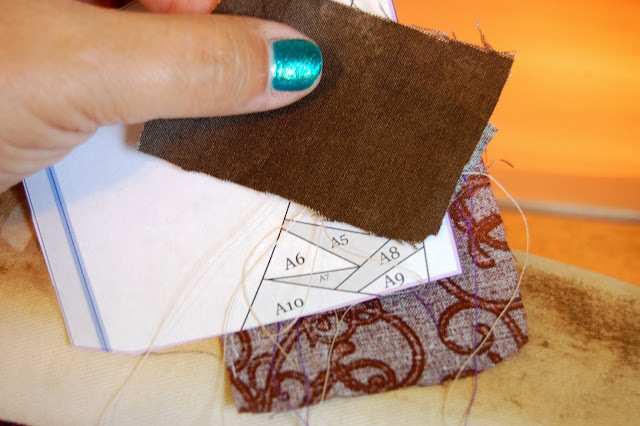 Set the fabric in the center of A1, so that when you sew along the border of A1 and A2, you can then flip that dark brown fabric so that it covers the A2 area on the paper. Tape your fabric in place if you want to keep it from shuffling while you flip it over, you will be sewing blindly. Flip the paper over so that the fabric is underneath and you can see the puzzle. 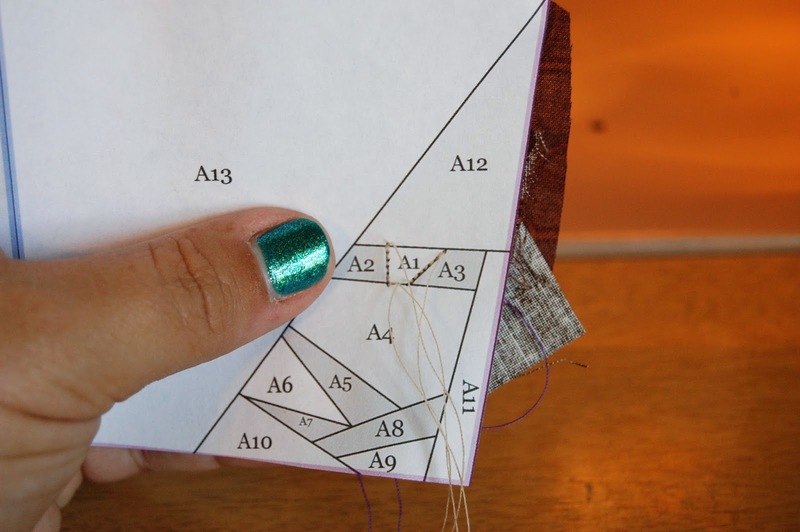 Sew along the border of A1 and A2 only. 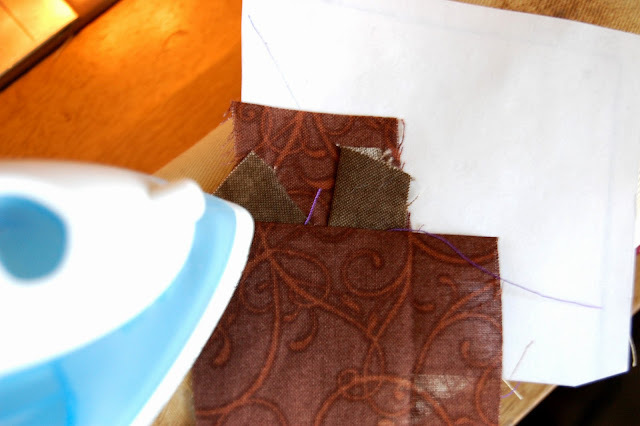 When you turn it over to the back, flip the dark brown fabric (remember it was right side down), and press the seam with your iron. Move to the next number, A3. That is his other eye so it is dark brown too. Place it right side down again in the center of A1 on the paper. 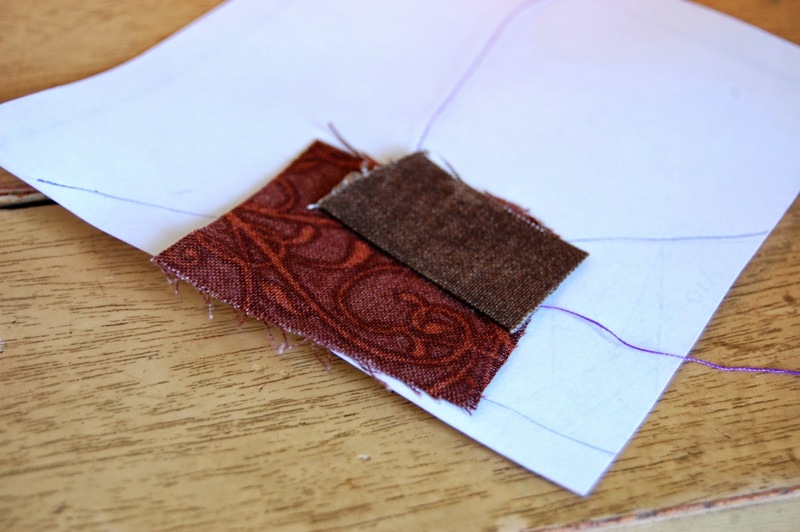 Flip the paper right side up (with the fabric underneath again) and sew along the border of A1 and A3. 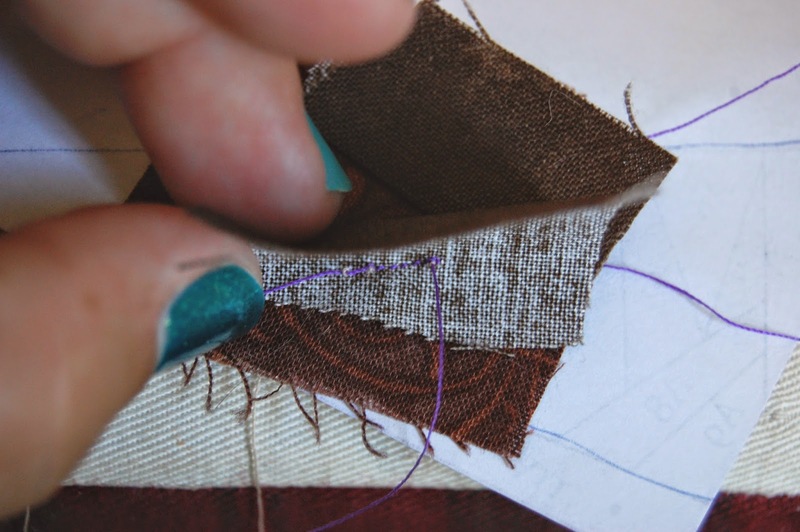 Always sew along the border of the piece you are trying to attach. Turn the paper over and flip the fabric so the right side is showing. Iron seam flat. Can you see the shape of the eyes compared to the photo below? Next is piece A4. I placed the fabric right side down ABOVE the area I want it to cover, letting it dip well below the A4- A2/A1/A3 border so as to make sure I can catch the fabric when sewing blindly... see it sticking out on the top right side of the paper? Remember, we need seam allowances (fabric to overlap edges) and we need the fabric to fold DOWN over the area you are trying to cover (A4). Stitch along the A4 border. 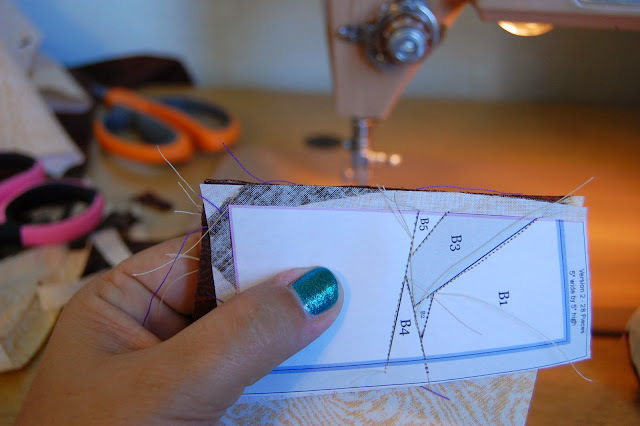 Flip the fabric so that the right side is up and press seam flat. A5 is the upper mouth... see how big I cut the fabric to cover the A5 piece? Go big!! This is the A5 piece in relation from front of the paper to back of the paper where the Sorting Hat is coming together.The A5 piece is right side down (remember, always sew it on right side down), see how the fabric is positioned so that the edge overlaps the A4-A5 border and is opposite (mirror image) the A5 piece of puzzle (the highlighted line)? This is what it looks like on the back after it is sewn along the A4 border. 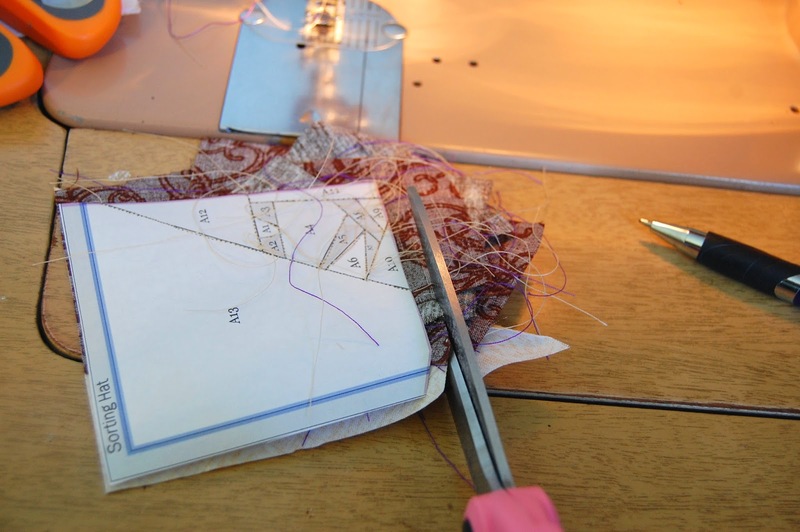 Here is the last piece being sewn on. You can see how to position the fabric a bit better since it is such a large piece. 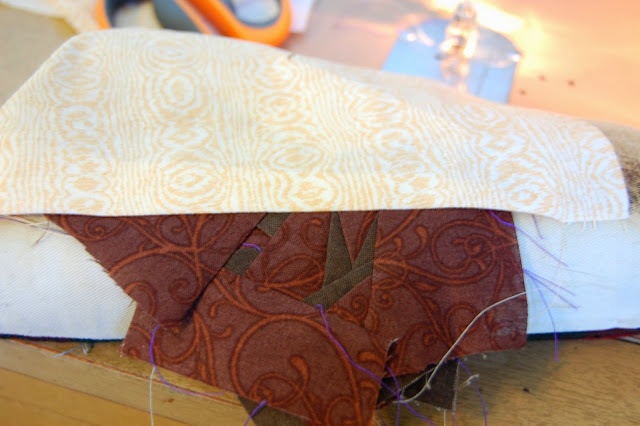 This is the large A13 area of the puzzle that is to be the pale wood fabric. See how it is placed pretty side down (on the BACK of the paper) and is ABOVE the area to be covered? Once this is sewn it will flip down to over A13. 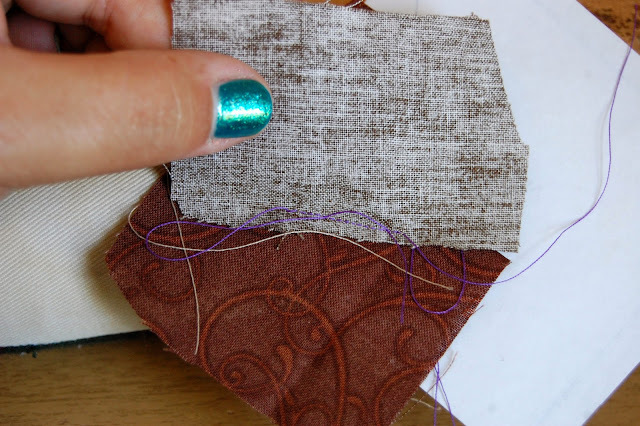 Trim the excess fabric from the edges along the grey seam allowance border. When you get to the inner area without borders cut 1/4 of an inch AWAY from the edge. 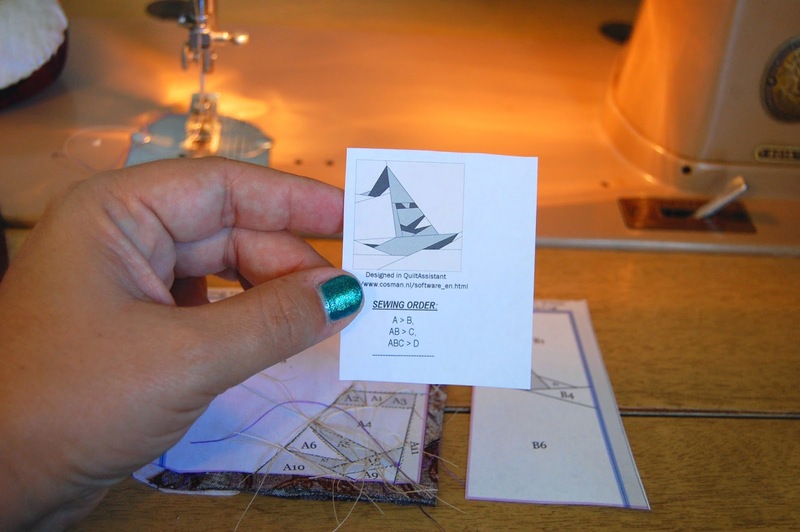 This provides a seam allowance for sewing the pieces together. Follow your key! 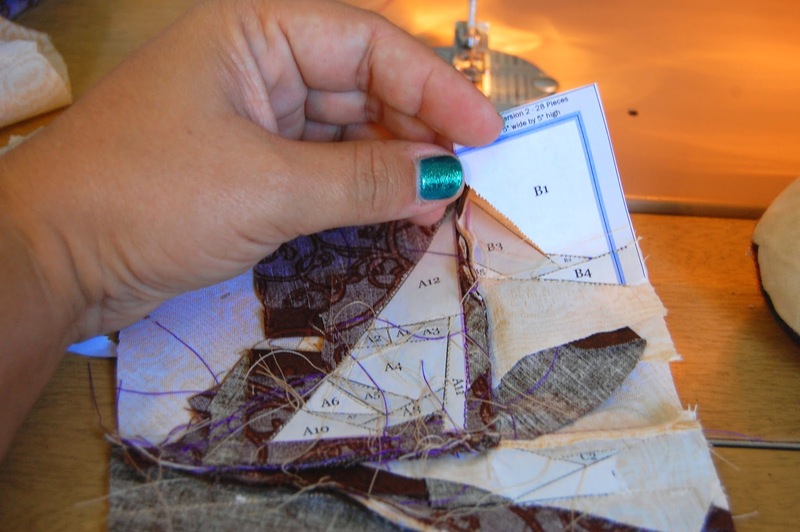 Sew piece B together next. Once B is done, follow the key and sew piece A to piece B. 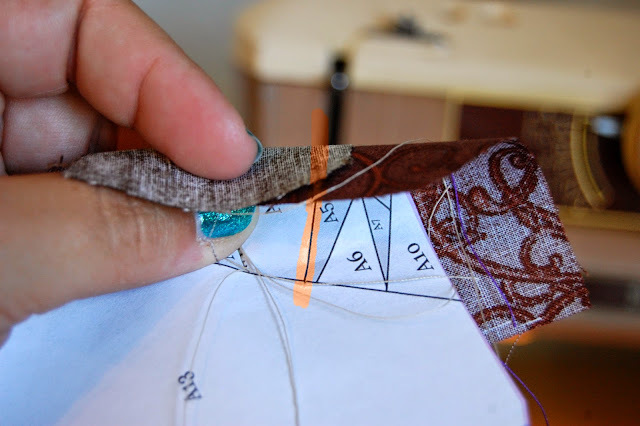 Press seam to the side using hot iron. This is another shot of how to start a new piece. Place the number 1 fabric (D1 in this case) right side up (on the BACK of the paper) and lay the D2 fabric right side DOWN, OPPOSITE (mirror image) the area you want it to go but still over lapping the D1-D2 border by quite a bit. Sew along the D1-D2 border, then flip D2 fabric in place and press. This is what it looks like on the back of the paper. 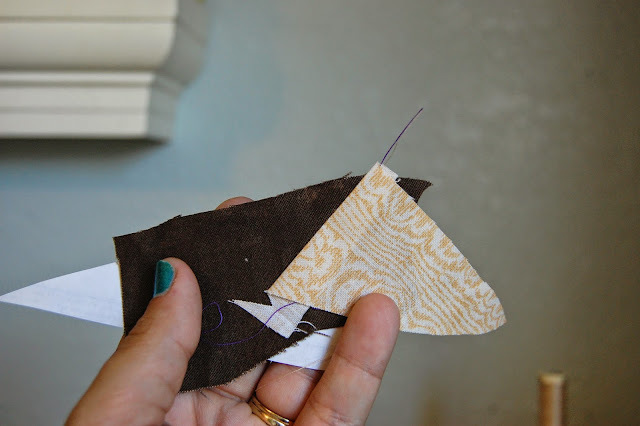 Once the block is complete, press again, and remove paper pieces. I do this last so I can keep them as a guide to connect them correctly. Please pull carefully. 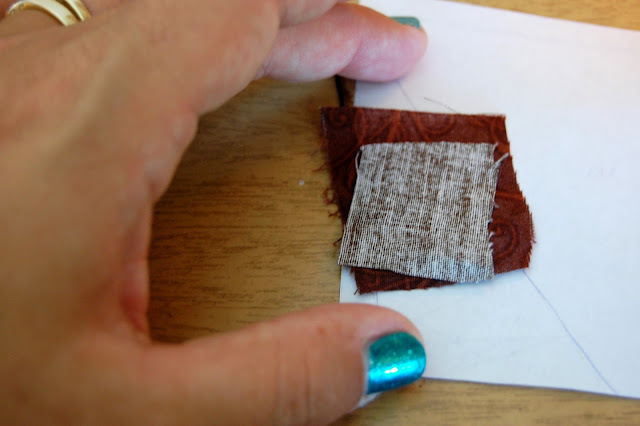 Vellum or wax paper can be used in place of paper too. My imperfect Sorting Hat. It is alright if edges don't align just so, or there are blips here and there. These things make it unique and yours. Embrace them. 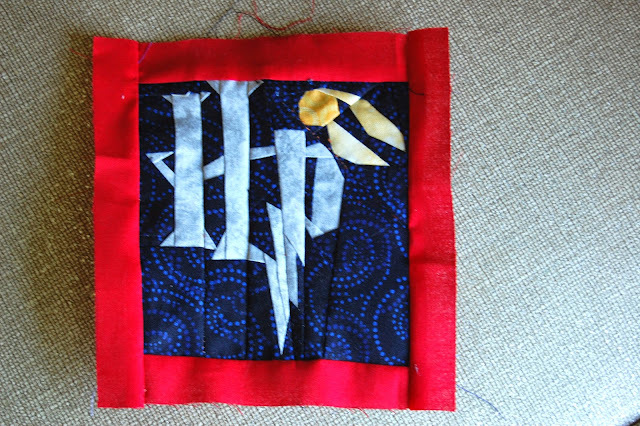 I am almost done with the Harry Potter blocks. I have the Deathly Hallows halfway done, Platform 9 3/4 printed, and this morning I printed off a stag Patronus and Dobby. I <3 Dobby. There will be a background fabric and some embroidery on the borders once this quilt gets done. I have visions of reading Harry Potter to my daughters snuggled under this quilt on starry, chilly nights. I do hope you check out Fandom in Stitches. They have a closed Facebook group too for posting pictures, asking for help and general cheering on of projects. How do you feel about quilts? Need clarification on the tutorial? I know it was a beast! All I can advise is to play, practice and don't give up! To see the finished quilt click here. It's all baffling to me but so cool to watch it all coming together. That's going to be one awesome quilt. Can't wait to see what the LotR will be like!! Good morning Deb! It is probably better to use videos for these types of tutorials. It is challenging to convey via still shots and words. Hopefully it will help someone. Glad you didn't mind following along. 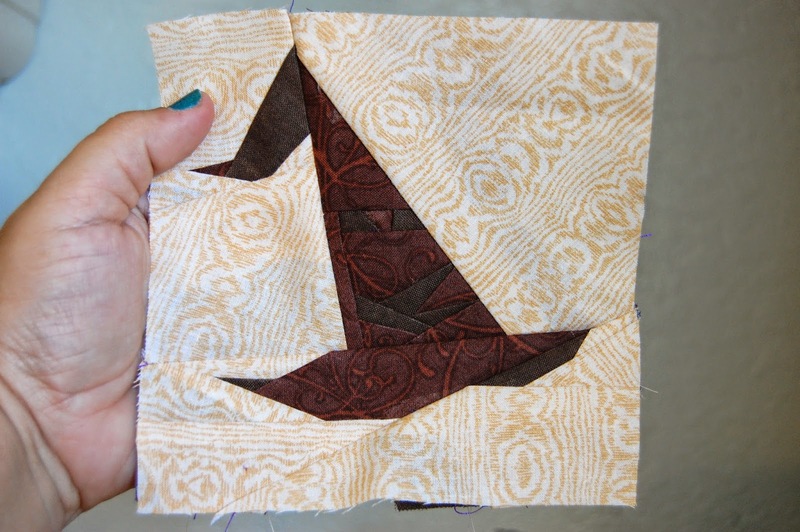 I am getting excited for this quilt now that I have the border fabric ready to go. The LotR quilt is amazing!!! I will share it for sure once I get going on it. This is really cool. It reminds me of origami. By the way samples are back and track, I can't believe it, and arriving today. You are right Jean! It is like origami. Never made that association. Alright! >fist pump< I was thinking some postal worker fell under the spell of enchanting aromas emitting from the soap package and was hiding them captive. Looking forward to sniffing today! Thank you again. I love it!! Can't wait to see the finished product!! It will be a work of art!! 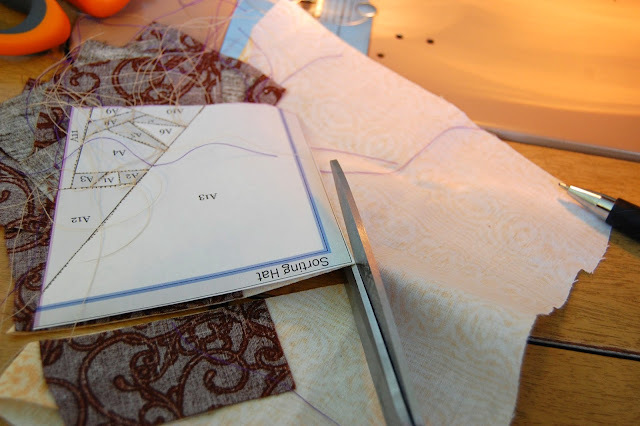 I am an admirer of quilts, but I don't think I have the patience or skills to attempt one. I like seeing your step by step process though. 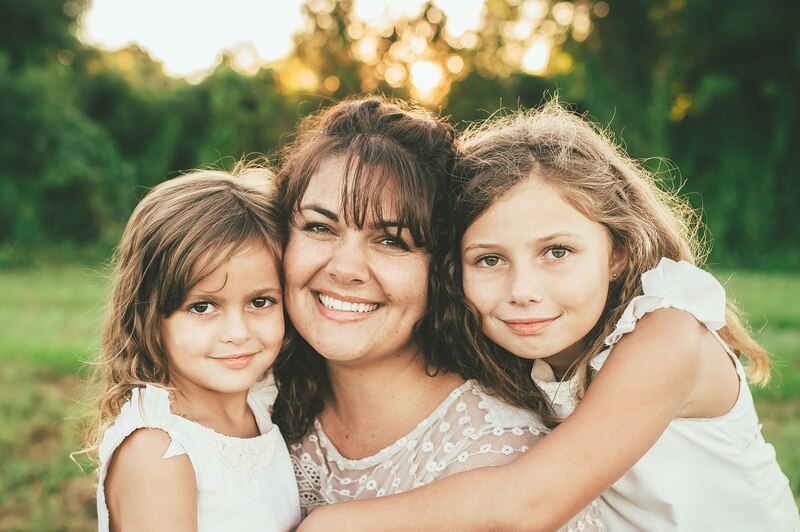 I'd really like to make t-shirt quilt for my girls, but it's a big undertaking for my limited sewing skills, LOL! 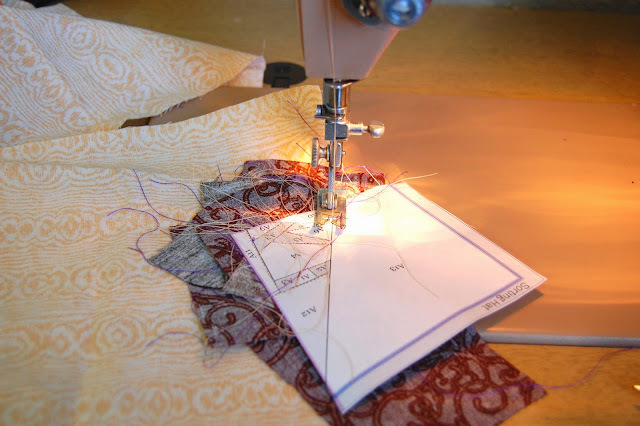 Happy quilting to you!! Thank you Tricia! I can help you make the t-shirt quilt, or I can make it for you :-) just let me know! Sounds great! 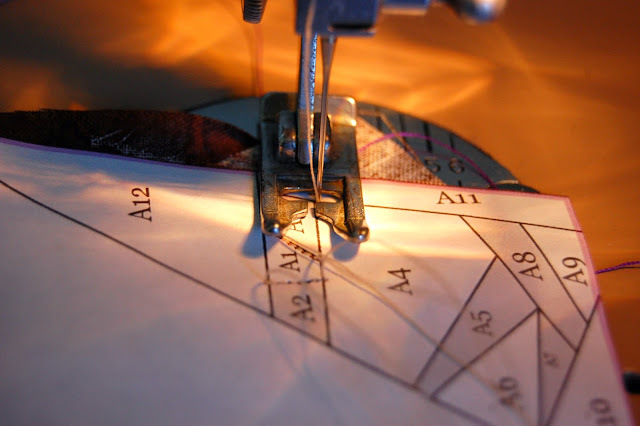 I love hand sewing too. I have a few handsewn quilts laying around here. But you are right, the machine makes it much much quicker. Patience is important. 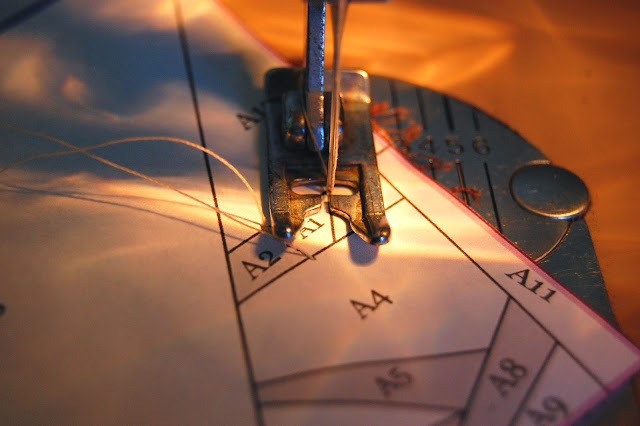 I have discovered that it is best not sewing after too much wine or too late at night. It is a fun hobby for me though. 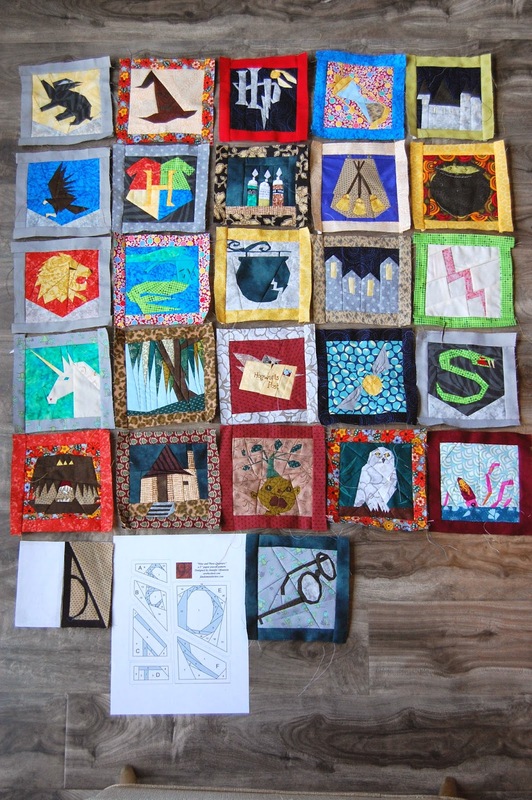 I am looking forward to getting back to this HP quilt when we get back home. It is calling to me!